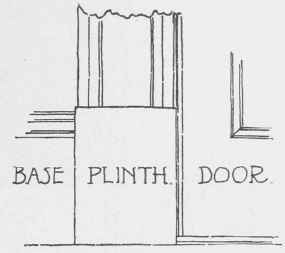 When the door frames are set the next operation will be to set the door and window architraves, called in some localities door and window "trim", although "casing" is perhaps the more common term. 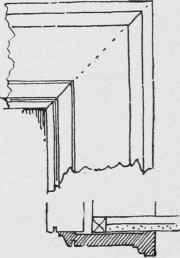 There are two principal methods of casing a door or window; by the block casing (Fig. 70a), or the mitred casing. 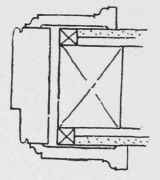 The superintendent should watch to see that all joints are carefully done, that margins are even on all sides, and that the mouldings are securely nailed. The mouldings must be scraped or sand-papered, or both, to remove all traces of the milling or planing, the effect of which is to leave marks upon the wood, and these imperfections will appear more noticeable when varnish has been applied. 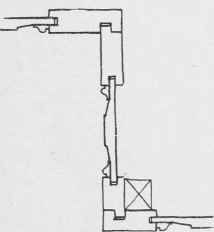 No casings should be spliced, although long horizontal mouldings such as bases and wainscot mouldings will have to be spliced, and care should be taken to see that this is neatly done. For painted work it is customary to nail the finish to the walls and frames with finish nails, well set for puttying. 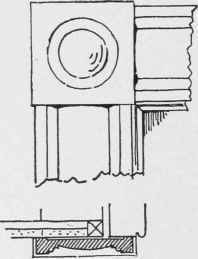 The nails should be driven in the quirks of the mouldings as much as it is possible. For hardwood finish the members should be glued together at the shop as far as is possible and no more nails used than is absolutely necessary. Wainscoting, if panelled, should be put together at the shop in as long lengths as possible, and painted on the back before setting, and angles and corners should be rebated together. (Fig. 72.) 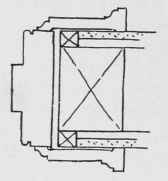 The projections of mouldings as well as chair rails should be studied in connection with the architraves to be sure that they are coming-together in a satisfactory maimer. Where a dado is used the line of the window stools will sometimes be made the top of the cap, and in this case especial care must be taken that the window frames may finish at the same level. Where a chair rail only is employed it is generally set about three feet above the floor.